You could be driving away in this fantastic MG3 Exclusive or splashing out with the £10,000 cash alternative if you are the lucky winner of our annual Car Raffle. Thank you to our sponsors for supporting the Car Raffle this year- Chorley Nissan, Alderson & Horan Funeral Services, Boohoo, Fuelcard Services, Burnley & Pendle Freemasons and Macadam Rescue. Tickets priced at just £2 each and you must be aged 16 or over to buy them. Manager: Helen McVey. “Gamble Responsibly” - Gamcare (www.­gamcare.­org.­uk Tel:0808 8020 133). Raffle tickets are not to be sold to anyone under the age of 16. The winner will receive the actual car that has been used for the promotion of the raffle. Registered in March 2019 (19 reg plate). 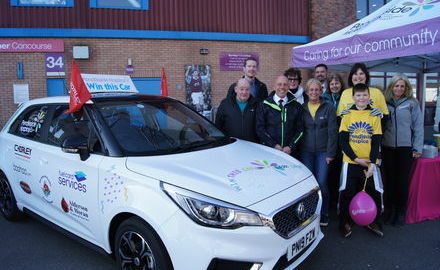 Pendleside Hospice's 2019 car raffle is underway!! Buy your tickets now online for £2 each and be in with a chance of winning the MG3 Exclusive or £10,000 cash!